This is an extremely rare watch with a documented history. Heuer Carrera Dato Ref. 2547N is a chronograph with a triple calendar. It is one of the most complicated watches Heuer has ever produced. The first owner of this watch was a British Navy soldier, who was based in Bahrain. In December 1967, the marine took up a loan at the NAAFI (Navy, Army and Air Force Institutes). With that money, he bought this beautiful Heuer Carrera Dato 2457N with the original double grain beads of rice Gay Frères bracelet. In March 1968, the watch was imported from Bahrain to England. The original papers proving the acquisition of the watch and the import to England are available. Furthermore, the watch comes with some photographs of the British soldier wearing this Carrera Dato on his arm. In 2017, he brought the Carrera to TAG Heuer for a service. The service invoice bears first owner's name. 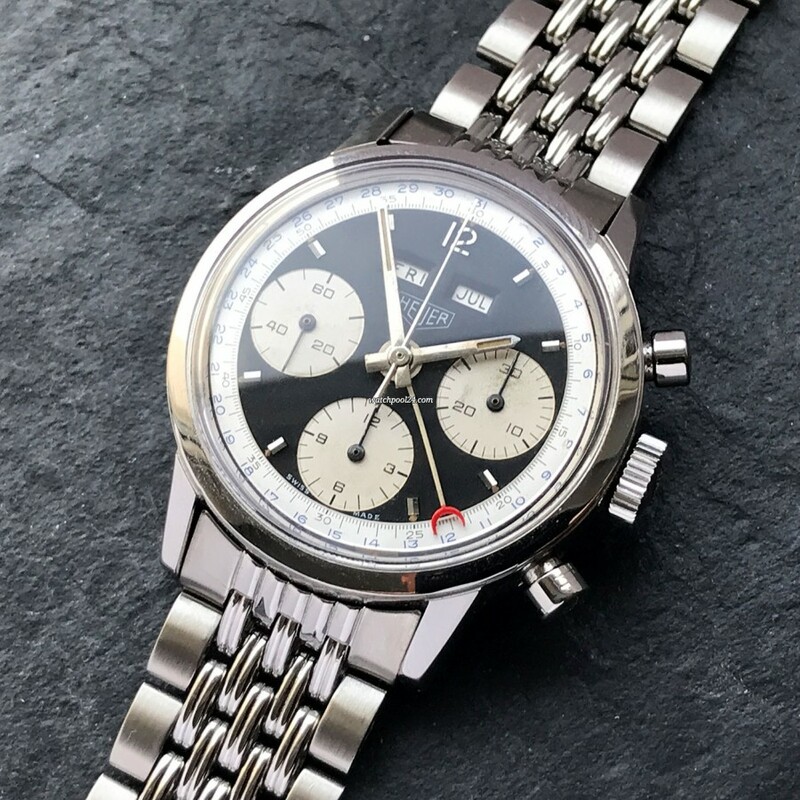 To sum up, the full history of this Heuer Carrera from 1967 until today is known and documented. Regardless of the interesting and possibly unique history of this vintage watch, the Carrera Dato charms with its attractive appearance and its complications. A chronograph and a triple calendar in a single watch. The beautiful reverse panda dial is perfectly balanced, even though showing a lot of elements. The three large silver sub-dials show the sub second at 9 o'clock, 30-minute counter at 3 o'clock and 12-hour totalizer at 6 o'clock. The outer date ring of the dial has blue numbers on silver background. The red crescent-shaped tip of the date hand surrounds the current date on the date ring. The windows of the day and the month are positioned above the Heuer logo at 12 o'clock and have a white background. The matt black surface is absolutely perfect and without quirks. The silver sub-registers and the tritium lume show an original age-related patina, which makes this Carrera very authentic and honest. The case measures 36 mm and has a snap-on back. Two adjustment buttons for the day of the week, month and date are located on the left side of the case. The correct crown is Heuer-signed. The Carrera is powered by the Caliber Valjoux 723. This manual wind movement is based on the famous Valjoux 72, with an additional module responsible for the calendar complication. A wonderful addition to this watch is the original Gay Frères stainless steel bracelet. It's also known as the double grain beads of rice bracelet. The bracelet has HLA end links and is in a great condition. The clasp is stamped with 4/65. Considering that the collectors are willing to pay between 4,000 and 5,000 euros for the bracelet only, the watch is a bargain for the price offered here. This very rare vintage Heuer Carrera has an excellent design and a complicated movement and has been preserved in excellent condition. The fully documented history of the first owner is something unique. There is no reason why this vintage watch should not be a highly sought-after collector's item.